Contemporary sculptor Riel Jaramillo Hilario presents Baro/Balasang, an exhibit of wood sculptures on the theme of the Eternal Child at Art Informal that opened on April 29, Thursday. The title is Ilocano for boy/girl and the show collectively refers to the artist’s take on the archetype of the Puer Aeternus and Puella Aeterna - The Eternal Child of Jungian psychology. For the artist the archetype is an operative part of the psyche that contains a complex of ideas and feelings that pertain to the essence of childhood - innocence, pure freedom and unbounded consciousness sans the confinements of the idea of self. In its heart is the energy of perpetual youth: a realm of pure possibility and the fullness of being. Hilario explores this concept with the production of playful pieces with the majority of the works revolving around a reinterpretation of the 1914 classic The Little Prince written by the French pilot Antoine de St. Exupery. Hilario studied santo-making in Ilocos Sur in 1994, and later took painting and art history at the University of the Philippines. He returned to working on wood sculptures in 2002 and was a participating artist to the National Commission for Culture and the Arts traveling exhibit, Sungdu-an 3: Making the Local in 2003. 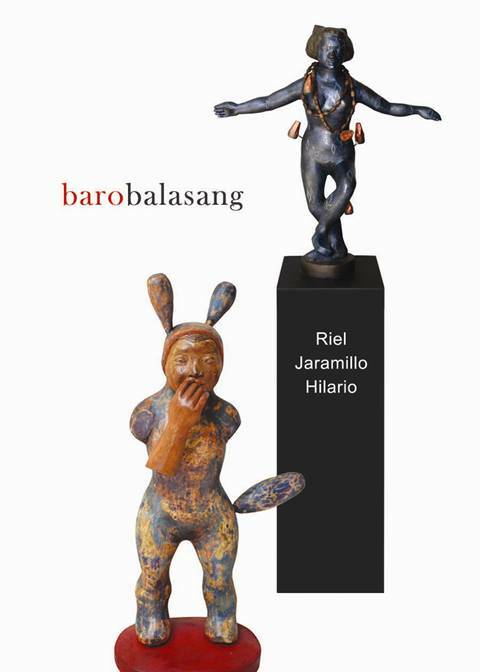 Baro/balasang is the artist’s ninth solo exhibition. Baro/Balasang runs from April 29 to May 16, 2010. For inquiries please visit www.artinformal.com or call (632) 7258518. Art Informal is at 277 Connecticut St. East Greenhills Mandaluyong City.